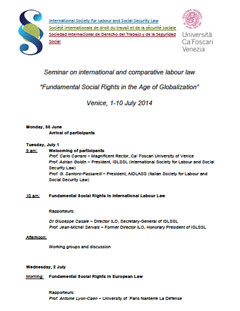 Below, please find the Scholarship Reports from the Seminar on International and Comparative Labour Law – Venice, Italy, held 1-10 July, 2014 at Ca’ Foscari University of Venice. Posted in ISLSSL Events, Meetings & Events, Venice Seminar 2014 on October 23, 2014 . Registrations are now open for participation in the Seminar on International and Comparative Labour Law to be held for the first time at Ca’ Foscari University of Venice (Italy), under the direction of Professor Adalberto Perulli. The seminar is aimed towards legal scholars, graduate students and experts specialized in international labour law and labour law. A good working knowledge of the English language is essential for participation. Priority will be given to those applicants whose enrolment arrives first, with the total number of participants reaching 30. For more information, please download the complete program and conditions of participation. In order, again, to achieve the statutory objectives of promoting the study of Labour Law and Social Security among the young legal scholars, now we begin the selection process for the award of six scholarships (1000 euro each) which includes accommodation, breakfast, city-transport (vaporetto), meals (2 plus 2 coffee breaks per day) and organization. Seminars will be in English, whose knowledge is a condition of participation to the seminar. The working groups will be in English, Spanish, French and Italian. During the seminar, participants will be assisted by four tutors: Vania Brino (Professor of international labour law), Marco Biasi (Ph.D. in labour law), Valentina Cagnin (Ph.D. in labour law) and Giuseppe Paone (Ph.D. in labour law). Participants will be housed in the University Junghans Residence (www.esuvenezia.it). Those who have benefited from a grant from the ISLLSS are not eligible. Scholarship winner must submit to the International Society of Labour Law and Social Security, within 30 days of the seminar conclusion, a report on its activities and contents. Both sexes are equally welcome but we encourage nominations from female candidates. Applications must be submitted to the national association of labour law and social security, that is the country of nationality of the applicant, accompanied by the applicant’s curriculum vitae, motivations for participating in the seminar, research interests, university affiliation and other elements and requirements that the national association considers relevant. The same application has to be sent in copy to dirittodellavoro@unive.it. In order to ensure the widest scholarships international distribution, ISLSSL will agree one scholarship to each country, so that if the national association shall receive more than one application, a selection procedure will start, based on considerations of merit and experience, (set by each national association); if that none of the candidates is eligible to be a beneficiary of the scholarship, the selection will be declared unsuccessful. National associations must notify ISLSSL before the 15th of April 2014 the name, CV and other information provided by the candidate which has been selected. In the event the number of candidates nominated by national associations is greater than the total number of scholarships available (6), ISLSSL through the International Scientific Committee of the Seminar, shall select the six candidates. This Committee will have a maximum of 20 days to identify the 6 candidates that will receive the scholarships. The decision cannot be appealed. We invite ISLLSS national associations to open immediately the call for the respective scholarship award, establishing deadlines and places for applications which will give an appropriate time for selection, so as to communicate the decision to the ISLLSS within the deadline. Posted in ISLSSL Events, Meetings & Events, Venice Seminar 2014 on March 5, 2014 . Posted in ISLSSL Events, Meetings & Events, Venice Seminar 2014 on February 7, 2014 .